A bobblehead, a nodder, wobbler or whatever you feel more comfortable calling it is a beautiful gift idea for a loved one. Are you worried, thinking of the perfect gift for that brother, lover, father, friend or mentor this holiday? We bring you a simple solution to your problem. Gift them a fantastic collectible toy. It’s fun and adorable. It has an oversized head compared to its body, and instead of a solid connection, it comes with a spring or hooks connecting the head to the body, in such a way that a light tap will cause the head to bobble, hence the name. You will find below 6 unique custom work bobbleheads that will make great gifts. There are very few things that can command the kind of respect that a good suit can. A well-tailored suit makes anyone look collected and put together. 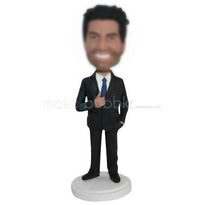 If you have professionals in your life that you would love to put a smile on their face or someone dear to you with big business goals, a customized bobblehead figurine is a great gift. Help them visualize their dreams by giving them a constant reminder of where they plan to be in the next couple of years. After all, they do for you, sometimes it’s hard to find the right words to thank a teacher. Teachers shape the minds of our children and our future and there are really no words to express gratitude for all that they do. Many of them are role models and they make a huge difference in the lives of children. 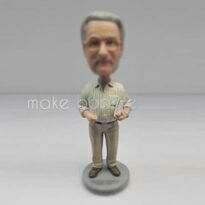 Whether you are a parent, student, or a fellow teacher, you can express your gratitude for all that they do by customizing a teacher bobblehead for them. This will show how much you appreciate what they do and encourage them to do more. Doctors are usually not given enough credit or the kind of appreciation they deserve. They work round the clock to ensure that people regain their health, most times at the detriment of their own health. The medical profession is one of the most important profession in the society and honestly, we need them for our everyday survival. A doctor is the “relief” who enters a family home on the brink of despair and takes the pressure off the patient and family, so the healing can begin. 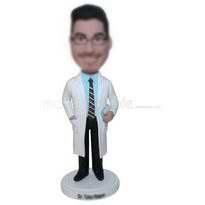 Appreciate a doctor today by gifting him with a custom bobblehead to remind him of the good work he is doing, because buried under the massive pressure they feel, they will emerge to help you, heal you and care for you. Those within the law enforcement are often looked at more negatively than they should but this shouldn’t be the case. It is their duty to protect and ensure the safety of the communities. And in the line of enforcing their duties, they are constantly putting themselves at risk for you, rapidly making decisions like the heroes that they are. 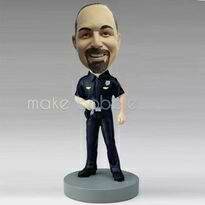 Why not say thank you to the most selfless human beings on this planet by giving an officer close to you a unique custom work bobblehead to appreciate their selfless sacrifice every day. Dads are pretty amazing human beings, but they often do not get enough credit for all that they do. Dads are great coaches, whether they’re coaching their kid at a game or through life, they do it so well. Asides from being a great coach, a dad is a fierce protector. They do not hesitate to instill fear in anyone that might want to harm their child. Don’t you just love the comfort of knowing your dad has always got your back? It sure does. 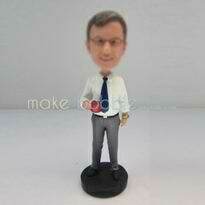 Surprise him with his very own custom work bobblehead today. Every day firefighters put their lives on the line to save people and property. Many of these firefighters are volunteers, so let’s pay them by showing our appreciation, thanking them for the valuable service they provide, and letting them know that we are very aware of the significant positive impact they have on our communities. 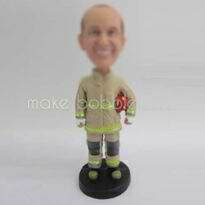 You can do this by gifting a firefighter you know a custom fireman bobblehead doll. Having a workplace bobblehead on your desk or your workspace shows your honest commitment and passion for your chosen career or job. Irrespective of the career path you have chosen, be it a lawyer, doctor, engineer or a firefighter, or one of the thousands of important people who make the system work smoothly and successfully, a workplace bobblehead is a great gift idea to inspire your loved one or even yourself and your colleagues.